Want to use your new BMW Scrambler or Urban G/S on more than just the pavement? Black Dog has answered the call of those who want to spoon on some knobby tires and explore further with our new ULTIMATE Skid Plate for this unique BMW offering. Don't take a chance on dinging up or denting those $2,100+ header pipes! Give your new ride the protection it deserves with the ULTIMATE in BDCW Protection. 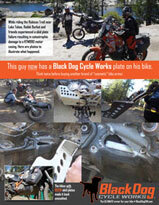 Black Dog has long been know for making the ULTIMATE Skid Plates for the entire GS series of BMW Motorcycles. With the introduction of the stylish and versatile BMW Scrambler, BDCW has modified the design of their ULTIMATE Skid Plate for the R1200GS Oil Cooled GS bikes to fit on the Scrambler. Trust us—you won't find better protection for your new ride. As with the oil-cooled GS bikes, the BMW R9T Scrambler and Urban G/S has some glaring issues that we quickly identified and remedied with the best plate design to enter the arena. We took the mounting points off the engine case (yes, BMW and many aftermarket skid plate manufacturers actually mounted them into the case with rubber shear bolts!) with a unique mounting system of a cross bar in the rear across the frame and front mounts that were designed to take the impact of major hits. We topped it off with two rubber Shok-Bloks beneath the engine case to absorb some of the impact. All and all this plate has become the most popular with the extreme riders because it stands up to the abuse they give it off road. We also were the first manufacturer to offer replacement parts for damaged plates instead of requiring you to buy a whole new one. Compatible with stock and full Remus and Akropovic exhaust systems. Please contact us if your aftermarket header is not currently listed. Larger dimensions mean your expensive engine has maximum protection. Plus, it fully protects the clutch, ignition cover, header pipes and catalytic converter—most other brands don’t. Other designs leave these completely exposed which can lead to a very expensive repair (the header pipes alone are $1,700 + labor). Skid plate is suspended from frame—isolating the rear of the engine block from impact. Our design does NOT use the stock rubber shear bolts that are threaded into the engine block. This design comes with the option to add additional coverage to the catalytic converter by the only means available, a side stand bash plate. While it is not anything special to look at, it does protect a very sensitive area exposed because of the location of the converter. Rubber "Shok-Bloks" act as additional shock absorbers against impacts to the bottom of the plate, protecting the engine block. This provides extra insurance from damage. Only six bolts are removed to access oil filter and drain—framework stays in place.